Click on a neuron to display its detailed information in this panel. "show glutamatergic local neurons in the left antennal lobe". NeuroNLP can be accessed from any browser supporting WebGL. Remember to check it out on your smartphone! Check out the Overview for a brief description of the layout and menus. Updates and annoucements for NeuroNLP.Larva. Want to get started? Go check out some real-time "Demos" for NLP queries and GUI usage! Sharing query results is easy with the "Tags" feature. Try create your own tags, or check out some previously created tags for the Antennal Lobe and the Mushroom Body. The electron-microscopy reconstruction of the antennal lobe of the first insta larva is published by M.E. Berck et al. . The tags listed below aim to provide an interactive visualization of the neural morphology originally presented in Figure 1, 2 and 4 in . The electron-microscopy reconstruction of the mushroom body of the first insta larva is published by K. Eichler et al. . The tags listed below aim to provide an interactive visualization of the neural morphology originally presented . Right-click and then drag the cursor to translate the entire 3D scene. On mobile and tablets, the scene can be translated by dragging with three fingers. Left-click and then drag the cursor to rotate the entire 3D scene. On mobile and tablets, touch and drag with one finger to rotate the scene. Scroll up or down to zoom in or out the entire 3D scene. On mobile and tablets, pinch out or in to zoom out or in respectively. Hover over a neuron and Left-Click to retrieve the detail information. On mobile and tablets, touch on the neuron with a single finger to select it. Hover over a neuron and Double-Click to pin it in the scene. Pinned neurons will always be highlighted. After pinning neurons of interest, you can use the remove unpinned neurons icon ( ) to restrict the workspace to neurons you are interested in. On mobile and tablets, select a neuron and then touch and hold on it for atleast 750ms to pin it. Right-click and then drag the cursor to translate the entire 3D scene. Left-click and then drag the cursor to rotate the entire 3D scene. Scroll up or down to zoom in or out the entire 3D scene. Hover over a neuron and Left-Click to retrieve its detailed information in the Info Panel. Touch anywhere on the scene with three fingers and then drag to translate the entire 3D scene. Touch anywhere on the scene with one finger and then drag to rotate the entire 3D scene. Pinch out or in to zoom in or out the entire 3D scene repectively. Touch on a neuron with a single finger to select it and retrieve its detailed information in the Info Panel. Select a neuron and then touch and hold on it with a single finger for atleast 750ms to pin it.Pinned neurons will always be highlighted. After pinning neurons of interest, you can use the remove unpinned neurons icon ( ) to restrict the workspace to neurons you are interested in. NeuroNLP.Larva is a modern web-based portal for navigating larval fruit fly brain data. NLP stands for Natural Language Processing, which means the website allows user to use intuitive plain English queries for in-depth exploration and investigation of brain structure. Neurons: 3D skeleton, neuron name, type, data source, neurotransmitter, transgenic lines, etc. Synapses:presynaptic and postsynaptic neurons, number of synapses. The NLP module allows for querying neurons and synaptic partners by a variety of attributes of the query targets (refer to Search Bar section below for examples). NeuroNLP can be accessed from any browser supporting WebGL. Try it on your smartphone! Header bar: provides operations such as hide neurons, create tags,etc. 3D visualizer: 3D skeleton visualization of queried neurons and the underlying neuropils. Information Panel: detailed information including synaptic partners of neuron pinned in the visualizer. Search bar: natural language interface for query neurons. The Search Bar is the central querying interface. It supports natural language queries of neurons, synaptic partners, etc. By combining various attributes of query targets, you can create some very powerful queries. Note: show neurons will reset workspace (clear existing neurons, reset viewing angle). While add will preserve the current workspace. Information panel is your major source of information regarding the individual neurons and its pre-/post-synaptic partners. Selecting a neuron by clicking on the 3D skeleton will change the content of the information panel to display details of the selected neuron. Neuron metadata:provides information including data source, neurotransmitter, transgenetic lines, synaptic summary. Synaptic Partners List provides additional functionalities regarding synapse queries. Here, an exhaustive list of pre-/post-synaptic neurons currently available in the database is displayed in 2 long lists. You can filter the list either by name of the neuron in input bar, of by the minimum number of synapses in the input bar. By iteratively selecting and adding neurons, you can construct multi-layered neural pathways with ease. You can minimize the info panel by clicking the button, or resize the panel by dragging its right border. 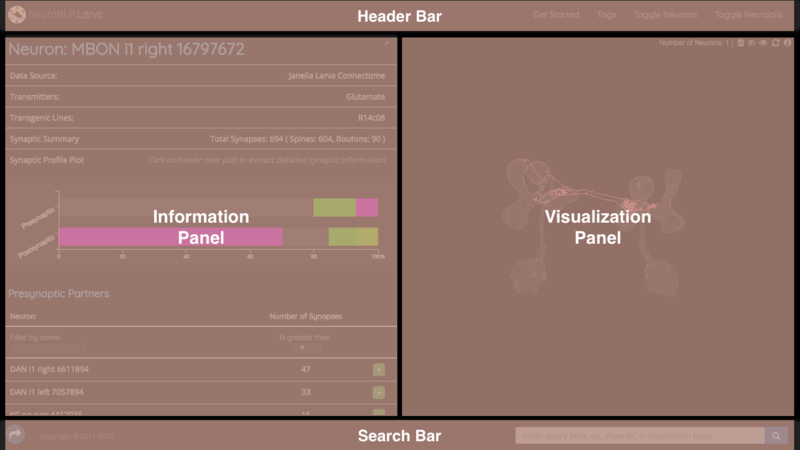 The visualization panel provides a interactive workspace of neuron skeletons in the context of relevant neuropils. It allows you to change view, select neurons, pin neurons, etc. In addition the the neuron and neuropil mesh files, the visualization panel provides a list of useful buttons for ease of interaction. For more details regarding the visualization panel, click on the button on the top right corner of the panel. Pinning neuron of interest and removing all unpinned neuron by clicking the button is a good way to clean up the workspace and keep only the neurons of your interest.